Klargester are a leading supplier of wastewater management solutions, with their products meeting consistently high standards for efficiency and reliability. Due to our commitment to quality, we are proud to provide customers with many Klargester sewage treatment plants and other such systems, depending on your needs. This month, we’ll be giving you some more information on the high-performing, environmentally safe Klargester BioDisc sewage treatment plant. 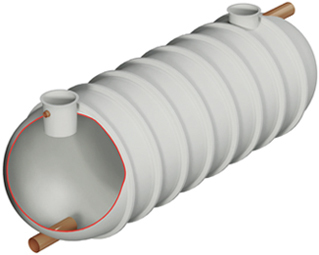 The Klargester BioDisc is an efficient and dependable sewage treatment system which is perfect for domestic properties. Designed with productivity and longevity in mind, the system is formed from corrosion resistant materials and is the only small domestic system which uses Rotating Biological Contactor (RBC) technology – a high-performing process for breaking down waste with a low carbon footprint. The BioDisc system consistently delivers effective wastewater cleaning, ensuring that post-processing, effluent water can safely be released into water courses or underground. The Klargester BioDisc is a low maintenance system with a high-tech control panel which clearly alerts the owner to any potential issues. The alerts come in the form of a fault code on the digital display and a beacon. These are very useful as they can draw attention to problems quickly, allowing them to be rectified before the situation worsens. Standard system maintenance – including an annual service and periodic tank emptying – will also need to be carried out. By carrying out regular servicing and preventive maintenance, you should be able to stop any extensive problems from developing. Wildon UK are experts in wastewater treatment systems, operating in Stoke-on-Trent and throughout the UK. We have a highly trained team who have the experience and skill to offer installation, maintenance and repair work for a wide variety of systems. For reliable advice and general enquiries, don’t hesitate to contact our helpful team today.